In this post, I think about the idea of the programming model and consider the occurrence of such over the recent years in the SAP development ecosphere. Update (same day): I interviewed Rui Nogueira on the new Application Programming Model for the SAP Cloud Platform. You can get the interview transcript and a link to the audio recording on this blog post: “Interview with Rui Nogueira on the new Application Programming Model for SAP Cloud Platform“. Hearing “programming model” in a UI5 setting was not unexpected, but it certainly reminded me of a long-running background job in my mind which was occupied with noticing and collating various uses of this phrase. The idea of a programming model is not new; looking at the Wikipedia entry for the phrase, and reading other articles that centre around the idea of a programming model reveals only that it’s a general term that is useful for collecting together technologies and techniques that work well together in a certain context or for a certain purpose. So it stands to reason that the phrase has cropped up over time within SAP programming contexts. I first started noticing the phrase back in 2016, in this form: “The ABAP Programming Model in S/4HANA”. This particular instance was the title of a session (DEV109) at SAP TechEd 2016. Earlier that year, Carine Tchoutouo Djomo published an excellent blog post whose title also included the phrase, albeit in a slightly different guise: “Getting Started with ABAP Programming Model for SAP Fiori Apps in SAP S/4HANA“. In 2017 Andre Fischer posted “How to develop a transactional app using the new ABAP Programming Model for SAP Fiori” (Andre and Carine are colleagues from the same team, and I was very happy to be able to connect with them both while I was at the mothership last week). Later that year Karl Kessler published an article in SAPinsider called “ABAP and the Cloud” and talked about the “RESTful ABAP programming model”, a phrase I’d also seen before and even shortened to “RAP”. Furthermore I’ve seen references to the “ABAP programming model for SAP Fiori“. So we have different terms that are used in variations of the same theme — terms such as ABAP, HANA, S/4HANA, Fiori, RESTful, and so on. Fast forward to today. 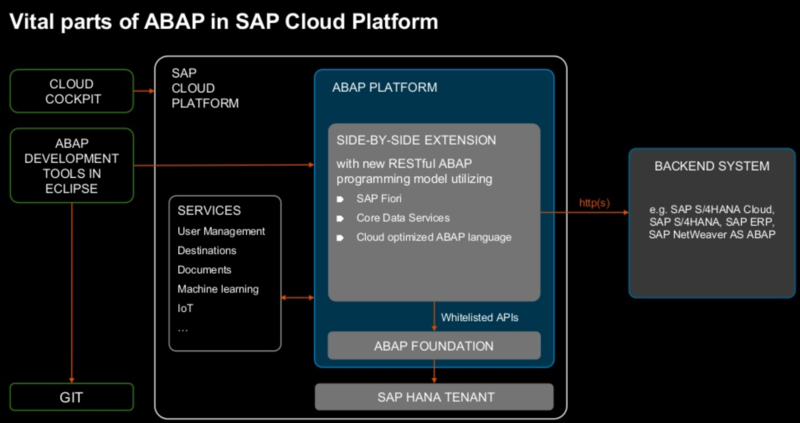 A couple of weeks ago at SAPPHIRENOW we saw the advent of the “Application Programming Model for SAP Cloud Platform”, which Daniel Hutzel introduced in a blog post “Introducing the new Application Programming Model for SAP Cloud Platform” and which I touched on in a couple of previous Monday morning thoughts posts (“the learning continuum” and “Core Data Services“). I’m suddenly mindful of the famous phrase “a maze of twisty little passages, all alike” from the 1970’s text adventure game “Colossal Cave Adventure”**. Anyway, on first sight, it would seem that these are different, competing programming models. It doesn’t take long to realise that that this isn’t actually the case. The biggest difference (and it’s not a big difference) is between all the previous programming models and the Application Programming Model for SAP Cloud Platform – and that difference is that the target runtime for the latter is the cloud generally, and the Cloud Foundry environment in particular. A model that moves us closer to cloud native development for sure. Digging in a little deeper, a general pattern emerges. There are many ways to express this pattern, but let’s frame our thoughts using a couple of diagrams. Elsewhere in the session, one learns why this model has emerged: what’s needed for today’s cloud-first world is a stateless, scalable, extensible context where we can build and deploy apps that are pleasant to use, that are able to support continuous and team-based work (via the concepts of draft, device switching and explicit collaboration), that allow us to plug into standard SAP-delivered application layers and extend them, and that have the right frameworks to support consistent development and support. The result is a separation of concerns, with Fiori and UI5 providing the infrastructure that faces the user, HANA providing the database management system with a rich set of features that augment the application layer, and a family of frameworks in the middle that allow the use of standard, open protocols (such as the REST-informed OData) and provide a consistent approach, via a common language, to modelling and implementing data and application logic. That language is Core Data Services, of course. But you knew that already, didn’t you? Along with the Service Adaptation Definition Language (SADL), for dispatching requests and dealing with model-based data retrieval and processing, and with the Business Object Processing Framework (BOPF) which helps us handle persistency and locking as well as providing us with mechanisms and patterns for extending standard processing (with actions, determinations and validations), this middle layer is really the heart of the programming model. Not surprisingly, if you look at the new Application Programming Model for SAP Cloud Platform, the same patterns emerge. The abilities to drive the application design and development by concentrating on the data model, the way the user experience (UX) and user interface (UI) are separate from this, but not so separate as to require you to start from scratch (yes, I’m alluding to annotations and metadata extensions that can be used to inform, or influence, what the UI looks like at runtime) and the extension possibilities … they’re the same. It’s just that right now, the target runtime for the middle layer is different. And that’s pretty much the point – a good programming model might have variations, but it’s the qualities of abstraction that are key. “Ooh, gosh” I hear you cry. The magic combination of the words “ABAP” and “SAP Cloud Platform” invokes in all of us some sort of feeling (dread, excitement, or a combination thereof). Yes. But once we get past the initial reaction and think about the context of what we’re looking at, the wonder of the pattern emerges once again. The general programming model, that encompasses the minor variations that we’ve seen, extends to this brave new world** in which a clean and pure version of our favourite backend programming language could become available to us to implement the backend application logic part of our model directly in the cloud, dovetailing with CDS and the related frameworks that we have seen. The more I think about it, the clearer the picture becomes. What started out as a slightly bewildering array of variations of names has become clearer as I meditate on the core meaning and purpose of each. And rather than confuse matters, the SAP Cloud Platform flavour actually stabilises the idea of the programming model for me. I hope that this morning’s post gives you some food for thought. Perhaps, like me, you’ve also been wondering about the array of programming models, and perhaps, if you’ve made it through my meanderings thus far, you will see the overarching patterns too. In any case, let me know your thoughts below. This post was brought to you by the clear sky of dawn over Manchester, and a friendly house sparrow that sat nearby as I tried to gather my thoughts into some sort of order. “Clear sky of dawn over Manchester”… nice to know the sun is shining (for a change) in my hometown! Any blog which clarifies this ‘Brave New World’ we’re approaching is very welcome (for ABAPers like me at least), and this nice little account helps a lot. Thanks! Cheers Ged. Nice to hear from a fellow Mancunian. Yes, the dawn was especially lovely today, and I had a nice view over fields to Manchester city centre, with the skyline that’s changing yet again these days (lots of new high-rise constructions, plenty of cranes). I do think it is indeed a brave new world; thanks for reading and commenting! CDS (with its different flavors): A stone that was thrown in the SAP world about 6-7 years ago, is the cornerstone of new programming models for building modern, SAP HANA-optimized, cloud and enterprise ready applications in SAP S/4HANA and SAP Cloud Platform. Thanks Carine, and again, thanks for the coffee and chat last week, I really enjoyed it and learnt from it. I like the stone metaphor, and also the image that it represents; there’s a similar story, IMHO, about the Internet Communication Framework / Manager combo that was added to the R/3 architecture years ago and is now pretty much the sine qua non of SAP systems today.